FIVE members of the PBA board disputed the move by a majority bloc to deny embattled commissioner Chito Narvasa a fresh mandate, saying the decision is not allowed under the league’s by-laws. “They cannot just act on a whim. What they are doing is not in accordance with out by-laws and constitution,” said San Miguel Beer governor Robert Non in a statement on Thursday as he spoke on behalf of the five teams. SMC, which owns three teams in the league in Star, Ginebra and San Miguel Beer, issued the statement after its board representatives as well as officials of KIA and GlobalPort boycotted a special board meeting called on Thursday morning. Representatives of the league's seven other teams moved to decline a term extension for Narvasa in that meeting and appointed deputy commissioner Rickie Santos as officer in charge. However, Non said the move by 'disgruntled members of the PBA board' was unauthorized and therefore not binding under the league’s by-laws due to lack of numbers. “These officials do not constitute the majority needed to remove or appoint the commissioner and thereafter, make any changes in the PBA structure, “said Non. Non pointed out that under the PBA rules, a majority vote is two-thirds of its current membership, which is eight of the current 12 members. In this context, only a majority vote of two-thirds can remove Narvasa, he added. The former league chairman also insisted that Thursday morning's board meeting was 'unathorized' since the notice was only given last Monday, a violation of the seven-day rule for such. “So without this clear majority, all changes being made by these renegade members are not allowed, including the appointment of Rickie Santos as officer-in-charge, and would not be binding on the whole board membership,” Non said. “This includes as well the misrepresentation of NLEX board member Ramon Fernandez as PBA chairman, when in fact, the sitting chairman is still GlobalPort’s Mikee Romero,” he added. Non said the majority bloc cannot also cannot cite any instance that would back its claims against Narvasa, "save for the MVP teams' dissatisfaction with the recent trade consummated between the San Miguel Beermen and Kia Picanto." Non also revealed that prior to Thursday’s meeting, five members of the majority bloc met with Narvasa at the UCC Cafe in Libis last Monday. 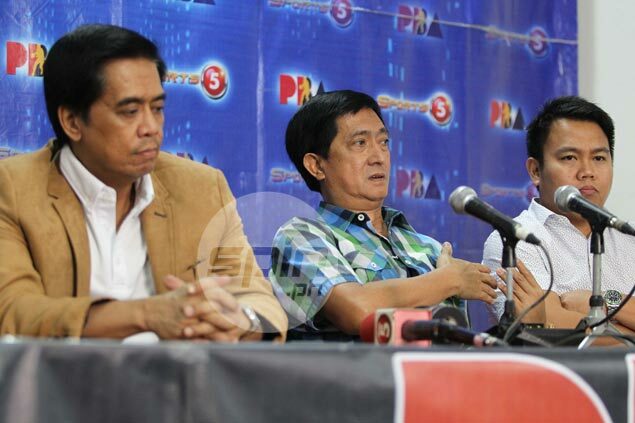 According to Non, Narvasa attended the meeting on the belief that it was only with Fernandez to discuss PBA’s planning session and did not expect four other board members - Dioceldo Sy (Blackwater), Mert Mondragon (Rain of Shine), Raymund Zorilla (Phoenix), and Dickie Bachmann (Alaska) – to be present to discuss his removal from his post as commissioner. “This move does not sit well with the rest of us board members. Any move should be made in the proper forum and must be covered by the league’s rules and regulations. Any move beyond this is definitely not allowed, “Non said. Non also accused the rival group of having the "habit of changing commissioners at a whim," citing the decisions to remove Commissioner Noli Eala and Sonny Barrios in the past. “If we allow that to happen, then this will weaken the Commissioner’s Office and turn it into a puppet of whoever is the most powerful among the team owners,” Non said.